Salmon is my go-to dinner for those days when I feel like my daughter hasn’t been eating enough healthy food. t’s pretty much the only truly healthy thing that she really loves to eat. She calls it “pink fish” and she will always put away chunks of steamed, roasted, or pan-seared salmon like it’s candy. No idea why, but I’m not gonna question it. My point is that I often have leftover salmon, and I also keep a few cans of salmon in the pantry for days I forget to defrost any proteins. 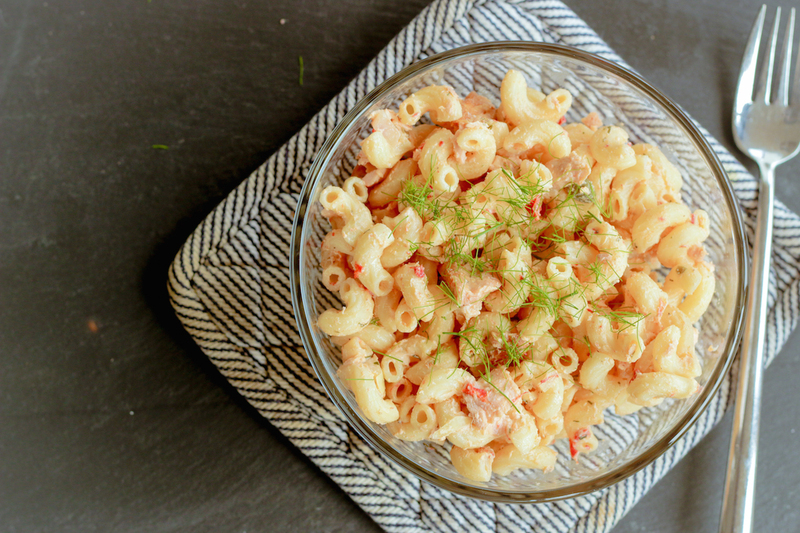 This is a simple, easy recipe for leftover salmon, and it works no matter how the fish was originally prepared. Salmon, cooked – however much you desire. 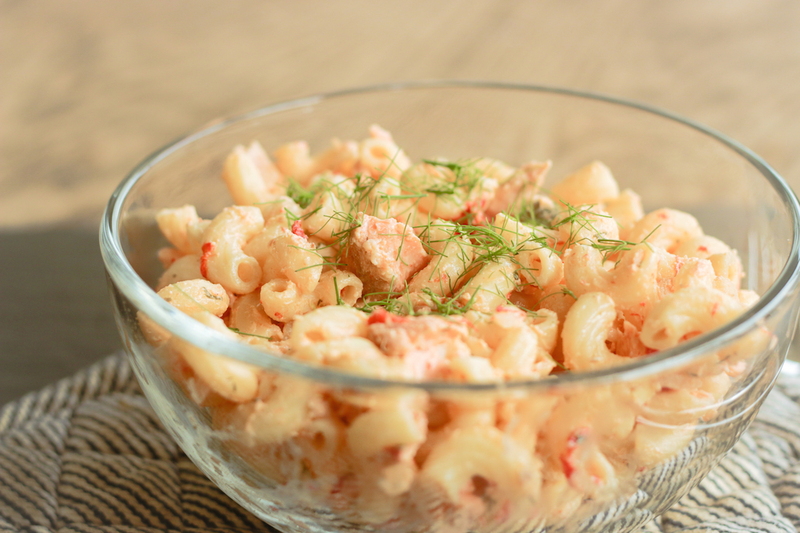 Whatever you have leftover, or a can or two depending on how salmon-filled you like your pasta salad to be. I used about a pound in this one. Boil the pasta and cook according to package directions. Chop the salmon or flake it, however you prefer. Mix remaining ingredients. Add cooled pasta and salmon, stir to coat. Let sit in refrigerator about an hour to enhance flavors. This pasta salad is also great with fresh diced green, red, and yellow peppers and some people even enjoy it with peas. For a little more bite mix in some hot sauce. Enjoy! 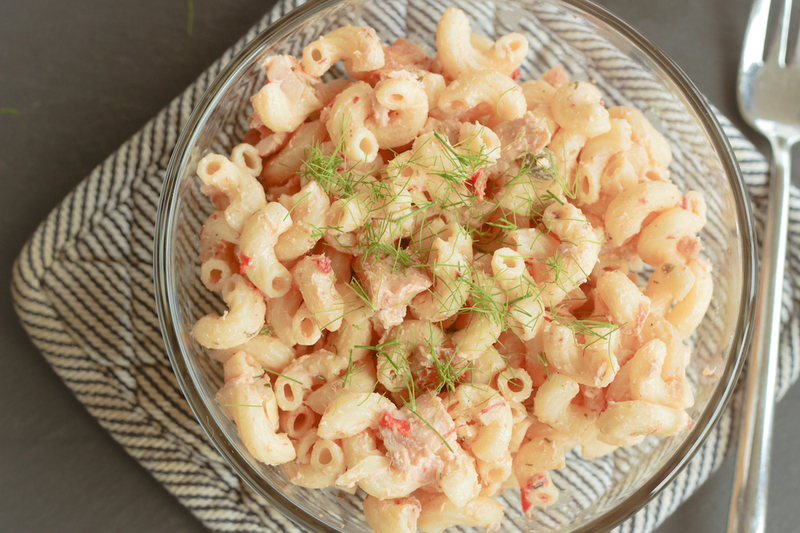 I have a hard time getting my kiddos to eat salmon so I’ll have to try this “pink fish” recipe out on them. Thanks for the new idea!